From PH000 through PH202, the Scorpian Resistance functioned as a land based guerilla faction composed of survivors of the cylon holocaust. There were two groups — a lodge based group of survivors from the wilderness resort near Harkin's Lodge, and a smaller group holed up at Grifter Falls Ranch. Surviving many months of occupation was rough on the fighters, and many were lost. Contact with the CEC Kharon occurred within the first three months of occupation, but communication and exchange of information broke down due to the difficulties presented in overcoming jamming, and also getting close enough without revealing the location of the Res bases to cylon DRADIS. Some fighters elected to to back to the Kharon to enlist, and others chose to stay. Finally, Kharon returned to Scorpia to make contact one last time, and the ground forces shared information they discovered. A work camp with hundred of survivors was in operation near Tinos, and a joint plan was hatched to liberate and destroy the facility. A hard battle claimed the lives of over three hundred people, but many were freed. Some of the Resistance chose to stay on the surface, giving up their spots on the evac for other civilians. Over 150 were rescued, and they have, to the last man, enlisted into service aboard the Kharon, and now Hestia. The surface of Scorpia is left in the hands of the remaining cylon occupation, and those brave few souls who chose to stay behind. The focus of the game has since shifted to the military, our eyes turned to the struggles of the men and women who wear the Colonial uniform. The Cassiar Province of Scorpia is located in the northern hemisphere of the planet, at around 60 degrees latitude. It is a fairly rural area, known for its majestic forests and mountains. There are only two major cities to speak of, and even those pale in comparison to the metropolises found elsewhere on the planet. A favorite of naturalists and outdoorsmen, the primary industry of the region is tourism. In the center of the province is the lush Cassiar Provincial Forest, home to countless species of animals and centuries-old trees. Much of the forest had been declared a protected wilderness area by the government, with heavy restrictions on hunting and camping. Obvious exceptions were made in the zones surrounding the existing settlements, where humans had already left their mark. Bracketing the central forest are two great mountain ranges - the Icarus Mountains in the west and the Corinthian Mountains in the east. Although the peaks in the Icarus are higher, the Corinthian range stretches all the way down to the southern latitudes. 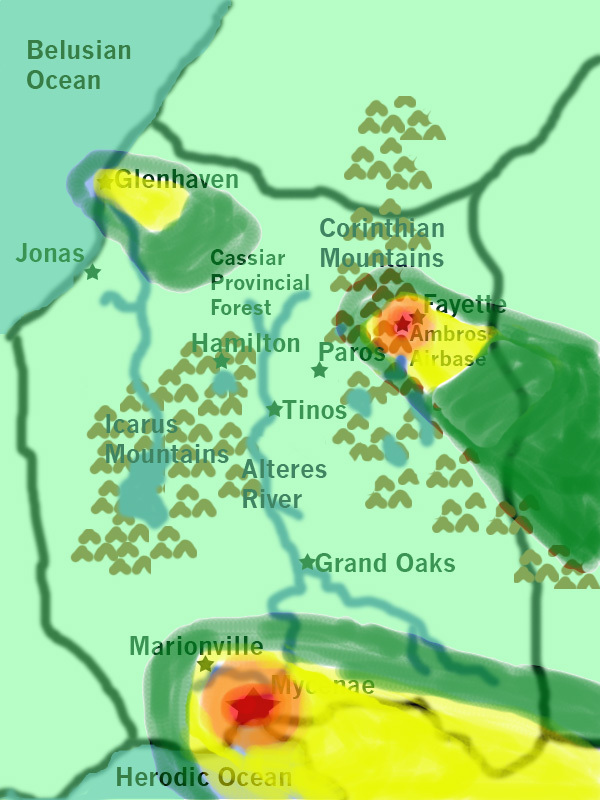 The two major cities are Mycenae to the south (population approx 1 million) and Glenhaven in the northwest (pop 500,000). Mycenae was the capital as well as the main starport and waterport. Glenhaven was a secondary port city, its poorer weather making it less appealing than its compatriot in the south. 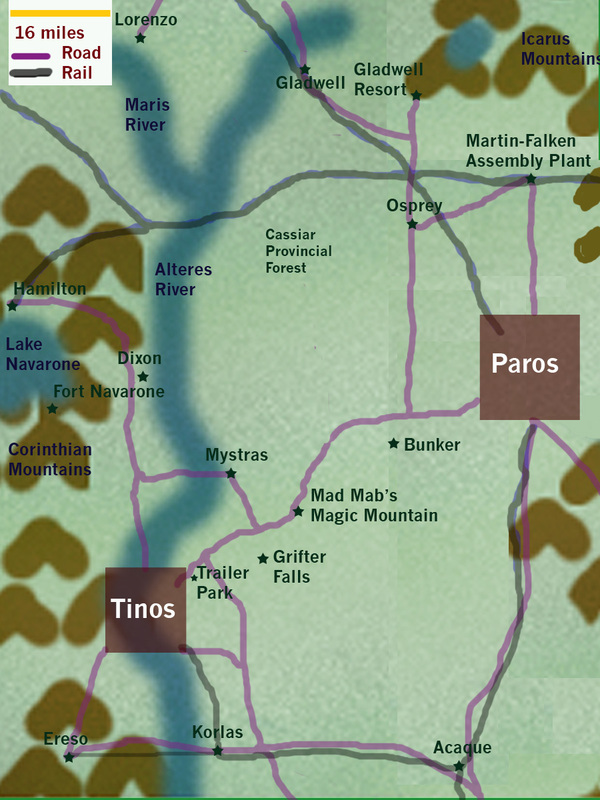 The twin cities of Tinos and Paros (pop approx 20,000 and 50,000 respectively) occupied the heart of the great forest. For more information about that region, see Paros Region. The southeast part of the province is mostly open prairie, dotted with farms. Towns with populations less than 10,000 (like Osprey) are not indicated on the map. There are many, scattered mostly in the areas around Glenhaven/Jonas and Mycenae/Grand Oaks. In the Tinos/Paros area there are about a half-dozen small communities like Osprey, sprung up around mines, road junctions, or other points of interest. The largest military base in the region is Ambrose Airbase, located in the east near the city of Fayette. Ambrose had close ties with the Martin-Falken Viper plant, getting newly-built Vipers ready for actual deployment. There was also a naval station (with marines and water navy ships) in Glenhaven, and a small marine training facility just outside Hamilton. Being at a higher latitude, the weather runs chillier than in the more heavily populated areas of Scorpia. Winters can be very rough, with the mountain towns regularly getting socked in with snow. Rainfall is heavier than average as well. Much of this information is not known ICly. It is provided for OOC reference only. Mycenae was hit with multiple, large warheads, leveling the city and leaving massive fallout behind. Ambrose Airbase was hit by a smaller nuke, which toasted much of Fayette as well. Glenhaven was hit by a neutron bomb, which delivered an initially high dose of rads that quickly dissipated with only minimal fallout. Red = Ground zero. Fatal dose within minutes. Rad meds will not help. Orange = Heavy fallout. Fatal dose within hours. Rad meds may keep you from dying, but you're still going to be very sick. Yellow = Moderate fallout. Fatal dose within a few months. Rad meds will keep you from getting sick. Dark Green = Light fallout. Fatal dose within a few years. Rad meds will keep you from getting sick. Light Green = Minimal fallout. Not directly fatal, but there may be long-term effects like increased cancer risk. Rad meds are unnecessary. 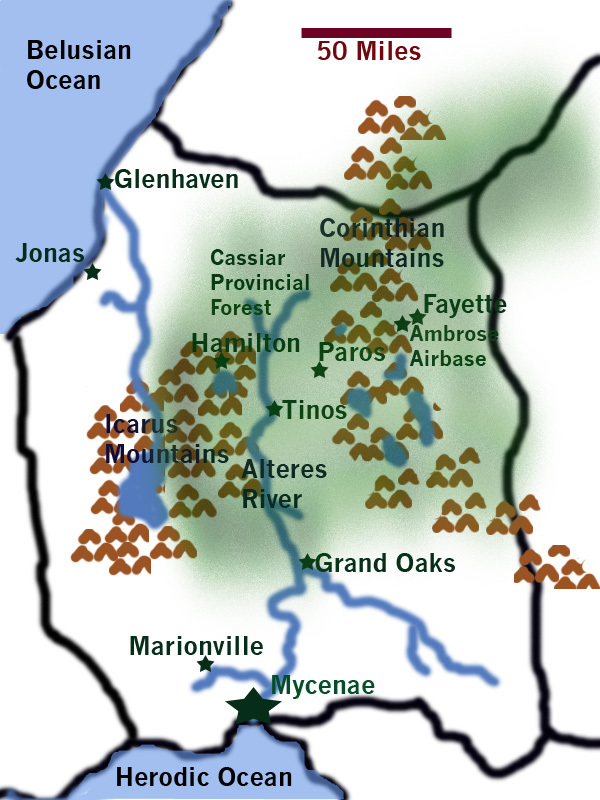 The twin cities of Tinos and Paros (population approx 20,000 and 50,000 respectively) occupied the heart of the Cassiar Provincial Forest in the Cassiar Province of Scorpia. They sprang up due to the valuable natural resources in the area (Tyllium, Lumber and various metals chief among them), but their growth was stymied decades ago by the provincial government declaring large sections of the surrounding forest a wildlife preserve. There are still a few mines and logging camps in isolated areas, but for the most part the industry has flipped to focus on tourism and ecology. See the main article on the Cassiar Province for general information about the region. There are a number of small streams and ponds throughout the area that are not noted on the map. The Martin-Falken Aircraft Assembly plant is located northeast of Paros. This largely automated production plant was one of the satellite facilities for the Colonies' largest producers of Viper spacecraft. It is located along a rail line that runs east to Ambrose Airbase, where final checkout and processing of the completed Vipers was done. Mad Mab's Magic Mountain is an amusement park located almost midway between Paros and Tinos. It is pretty large (RL analogy would be Cedar Point). Its isolated location is a bit of a puzzle to most, attributed to the eccentricity of the owners (including "Mad" Mab). Gladwell Resort is a posh resort in the foothills of the Icarus Mountains. Hamilton is a mid-sized tourist trap, located on the shores of majestic Lake Navarone in the Corinthian Mountains. It boasts a worlds-class ski resort. Further up in the mountains is Fort Navarone, a little-publicized CMC training facility used primarily to train special warfare personnel. The rugged terrain was loved by instructors who had a reputation for being the toughest in the CMC. Osprey is a tiny town (population 300 or so) that only exists because of the junction of Highways 19 and 606. Ereso is a mining town built up around one of the most prolific Tyllium mines on Scorpia. There are no other "towns" beyond what's indicated on the map. However, there are isolated cabins (like Grifter Falls), ranger stations, research posts, and campgrounds scattered throughout the area. Many humans took to the hills and forests after the attacks, building makeshift settlements. (Think Robin Hood or Defiance). Roving gangs have been known to terrorize these settlements, so people are generally isolated and wary of strangers. A gang has also taken up residence in Mad Mab's amusement park, though the park is big enough that you could avoid them if you're careful (or well enough armed that they avoid you). Paros and Tinos were both hit pretty hard with conventional weapons - bombs and strafing from the air followed up by Centurions moving through on the ground. The smaller settlements were also hit from the air, as were the amusement park and Viper plant. None of the settlements were completely leveled, so there is still stuff to scavenge and places to live if you're willing to take the risk of the Cylons returning. Paros and Tinos both have been occupied by the Cylons, with garrisons and regular patrols in the streets and around the towns. In Tinos, the activity is mostly concentrated on the western side of the city (along the riverfront and the portion of town west of the river). Osprey has a garrison as well, along with several large (50 feet) communication towers set up around the outskirts of town. Radios are jammed within 12miles (20km) of Osprey, but both the bunker and Grifter Falls are outside the jamming zone. The Cylons do not have an airbase in the region, and Raider patrols/flyovers are infrequent. Heavy Raider transports can be seen flying into/out of Paros and Tinos pretty regularly, landing in old parking lots or fields. The Cylons seem to avoid the forest between Paros and Tinos. Occasionally a patrol will make its way between the cities, but usually they stick to the highway.